Something New is Coming to Kickstarter! After a break from writing and illustrating, Natalie and I are at it again. Having found new inspiration -we are really excited about this new project. This new book is going to be amazing! This time around we will be doing things a little differently (for the better). With your help we will publish this as a hard cover book and bring a new character, named “Caddy”, come to life. Caddy will inspire young girls to think about science and technology under a new light. Not only will this book be available as a hard cover, but also as an eBook and in braille! Natalie and I illustrated and published several early reader books when she was 5 years old. She is now 9 and although her interests have changed, she still draws every single day! So this new project is intended for girls ranging from ages 6 to 106. Natalie beautifully illustrates and explains things the way that SHE sees them, this time introducing a new technology in an interesting way, that her young peers can appreciate and relate too. Sign up for our newsletter and to receive updates on the new book, coupons, tips and notification when it goes live on KickStarter. Subscribe to our newsletter for alerts and updates, we promise we won’t spam you! Did you know that many young learners think in pictures! Little ones often visualize what they are attempting to learn to help solidify the information in their memory banks! Think about the last time you needed to get somewhere you hadn’t been before. Even if you used written directions instead of a pictorial map, you probably had a number of visual markers such as unusual sights or signs to help you learn how to get there. Presenting children with illustrations of sight words along with their print versions helps them make important connections between the object and the word. Printing the words on a worksheet shortly after reading our colorfully illustrated books can go a long way! Flashcards or posters with a colorful picture and the word written under it are excellent sight word teaching tools. In addition, parents can have children draw their own pictures of each word on the same page to help them link the print with the visual. Our beautifully illustrated sight word ebooks are the perfect tool for introducing these words. An enchantingly affectionate cat and interesting story lines make this the perfect series of books to introduce your child to the wonderful world of reading! Each book is divided into three chapters and each have a vocabulary list at the end of each chapter for your young reader to review the newly introduced words. After your child is done reading the sight word ebook, help them to retain the material, by visiting our printable worksheets page, our flashcards page or our other printables page. An enchantingly affectionate cat arrives on the scene. It seems to like everything it finds and then those items mysteriously end up in a tree. This is the first in our series of sight word ebooks for kindergarteners and other beginner readers. The theme for this book is Colors. “I See A Cat” introduces level one Dolch words such as: I, see, a, cat, is, the, black, like, tree, big, bird, blue, in, hat, purple, bear, brown, duck, yellow, car, green, ball, orange, pig, pink, heart, red and has. 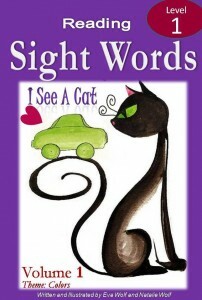 “I See A Cat” introduces 30+ sight words, includes 30+ beautiful illustrations (original water colors) and 30+ pages. Also available in Spanish! For more information about this book, click here. A pair of snooty mice show up and the friendly cat wants to play. Uh oh…here comes the rain, what will they do now? This is the second book in in our series of sight word ebooks and it’s theme is Movement. “Cat In A Box” introduces words such as: on, out, under, jump, down, up, look, open and close. 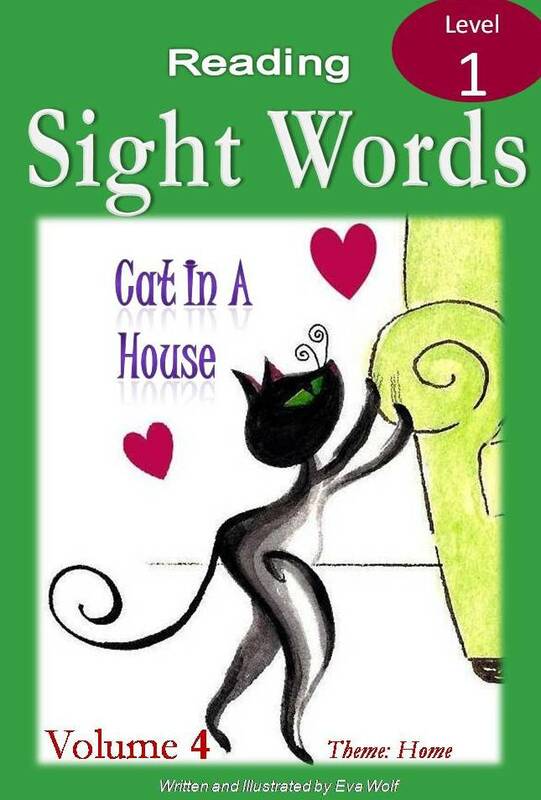 It also reintroduces and reviews a few sight words from Volume 1 “I See A Cat” such as: the, cat, likes, a, in, sees and is. 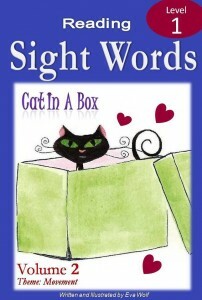 “Cat In A Box” introduces 28+ sight words, includes 26+ beautiful illustrations (original water colors) and 32+ pages. Also available in Spanish! A rabbit in need is a friend indeed. The cat and rabbit set out on a mission. The theme in “A Cat Helps a Rabbit” is Colors. 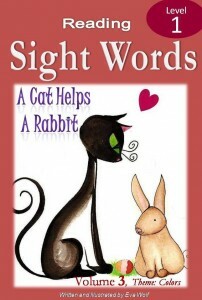 This book, third in our series of sight word ebooks, introduces words such as: rabbit, not, find, thing and help. It also reintroduces and reviews a few sight words from Volumes 1 and 2 such as: the, cat, likes, a, in, sees, is and look. “A Cat Helps A Rabbit” introduces 30 sight words, includes 27 beautiful illustrations (original water colors) and 30 pages. The cat is in a house – but is it the cat’s house? Follow along and look for clues in this charming night time story. The theme in “Cat In A House” is Home. This is the fourth in our series of sight word ebooks. The reader is introduced to everyday household words such as: house, door, chair, table, bed, eat and goodnight. The book also reintroduces and reviews a few sight words from Volumes 1, 2 and 4 such as: jump, up, they, run, down, on and out. 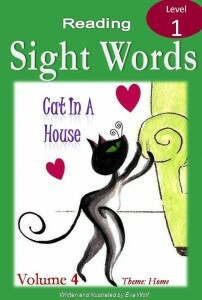 “Cat In A House” introduces 20+ sight words, includes 30 beautiful illustrations (original water colors) and 30+ pages.